When life gets tricky, Heather Baker meditates on fairy tales. 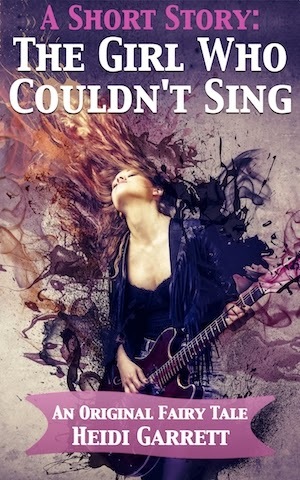 Heather Baker's dreams of becoming the next indie singer/songwriter sensation will come true. Enticed by Neptune, the planet that rules everything hazy and glamorous, and dogged by Saturn, the planet that rules obstacles and eveything practical--she bounces between fantasy and reality. Once upon a time there was a woman who didn't smile. She lived with a stern frown etched upon her face. On occasion, fleeting delight would catch her--like a doe in the headlights. Her lips would curve upwards, or she'd find herself unable to stifle a laugh, and someone would inevitably pronounce, "You have a beautiful smile." She would pass the palm of her hand over her face, erasing all signs of glee, and grimace for the rest of the day in devoted penance, because life was a vale of tears and suffering, especially for women. That's what her Bible said, at least--and the misogynists. The three short stories, The Girl Who Watched for Elves, The Girl Who Dreamed of Red Shoes, and The Girl Who Couldn't Sing, chronicle the journey of a girl who believed in fairy tales and are a prelude to the Once Upon a Time Today collection.